What is Toxoplasmosis and how can it affect me? Toxoplasmosis is a classified zoonosis (and an interesting one at that), which was first identified as a human pathogen in 1939. The parasite responsible for the disease, Toxoplasma gondii (or T. gondii), can infect most warm-blooded animals and is easily transmitted to humans through cats, the only animal in which the parasite can successfully mature and reproduce. Surprisingly, whilst it is little talked about, roughly a third of the world’s population is thought to carry the infection. Worryingly, most cats infected with T. gondii show no symptoms, so knowing whether your animal is afflicted is difficult. 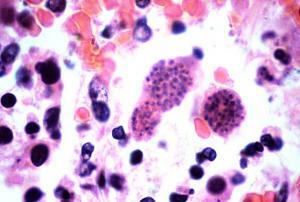 An infected felid will shed highly contagious oocysts a short while after infection, lasting for a period of 1-2 weeks. This may only happen once, but when the oocysts are shed (through faeces), they have the ability to survive and spread for months. There are various ways the parasite can be transferred from cats to humans, with the most common being through the faecal contamination of hands i.e. emptying the cat’s litter tray or handling infected soil without wearing gloves. Consuming contaminated meat, especially lamb and veal, coming into contact with raw meat and then touching your mouth or using contaminated utensils, are other known ways to transmit the parasite. If you eat unwashed fruit or vegetables that have come from infected soil, you also increase your risk of disease. Humans with contracted T. gondii will probably show no symptoms either. Unless you are immunocompromised (for example, if you have HIV/AIDS, are pregnant or are undergoing chemotherapy), the most you will experience is mild flu-like symptoms, including a sore throat, muscle aches and a slightly raised temperature (shown only in 10-15% of infected people). Because symptoms of Toxoplasmosis are so general, many cases go unnoticed. Antibiotic treatment is most effective for existing cases of acute T. gondii infection, although avoiding congenital transmission (from mother to feotus) requires more specialist testing and treatment. Compared to other parts of the world such as the Middle East, Latin America, Southeast Asia and parts of Africa, documented Toxoplasmosis in the UK is rare. It is estimated that 3 in every 100,000 babies are born with the disease in this country, having acquired it from the mother’s placenta. If a woman contracts Toxoplasmosis before conception or during pregnancy, the likelihood of her transmitting it to her unborn child is moderate to high. Ocular lesions have been seen in young children with congenital Toxoplasmosis, often leading to blindness in one or both eyes. Because a child’s immune system takes a year to fully develop, it is especially vulnerable to parasitic infection before this stage. If you are pregnant and think you might have been exposed to the T. gondii parasite, it is important to enquire about it at your next screening. Left untreated, Toxoplasmosis can have severe implications for both infants and adults (note: serious complications are rare in otherwise healthy individuals with a fully functioning immune system). These range from partial or complete loss of sight to cardiac disorders, encephalitis (inflammation of the brain) and behavioural changes. Perhaps the most studied and documented manifestations of the disease are behavioural, with considerable emphasis being placed on how T. gondii onsets conditions such as ADHD (Attention Deficit Hyperactivity Disorder), OCD (Obsessive Compulsive Disorder) and Schizophrenia. The link between Toxoplasmosis infection and neurological disorders and psychosis is only recent, but it is well supported. As yet, exactly why the parasite causes behavioural changes is uncertain, although more than 38 studies have found a positive correlation between T. gondii and Schizophrenia. It is possible that T. gondii antibodies affect the production of dopamine (a neurotransmitter that determines mood, motivation, sociability, sleep patterns and attention), with dopamine dysregulation being symptomic of Schizophrenia. Not only have studies found that individuals with the disorder have higher levels of existing T. gondii antibodies in their system, but they have also noted higher levels prior to the onset of Schizophrenia, indicating a causal link. Further supporting this, sufferers report a history of Toxoplasmosis in the family, more so than non-sufferers. Because of the debilitating nature of Schizophrenia, incidences such as traffic collisions and suicide are slightly higher in the affected population than in the general population, suggesting the potentially fatal effects of Toxoplasma infection. As yet, there is nothing to suggest that households with multiple cats are at greater risk of Toxoplasmosis. The term 'Crazy Cat Lady' was actually coined to refer to the various behavioural and psychological disorders associated with the human contraction of T. gondii found in cats, yet there is no hard evidence to indicate people with more cats have a higher rate of infection. Wearing gloves when cleaning the litter tray and handling soil that may have traces of faecal matter is the best method of defence against this silent disease. Is the parasite t.gondii in cats taken care of by monthly worming such as Broadline? Thank you.